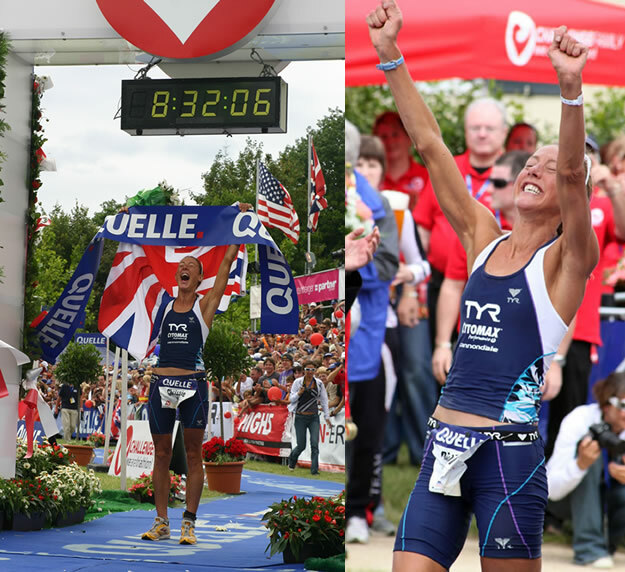 Last Sunday at Quelle Challenge Roth in Germany, Britain's double Ironman World Champion Chrissie Wellington maintained her unbeaten record at the ironman-distance, with her seventh win from seven starts. In the process, she smashed the previous world best time set a year earlier by Yvonne van Vlerken in the same race by 13 minutes and 49 seconds, setting a new mark of 8:31:59. I've been fortunate to be able to catch up with Chrissie post race, and talk about the event, her performance, and her plans for the rest of the year. First point of interest of our chat, which makes her achievement even more amazing was that Chrissie was sat in a doctors surgery in Germany as we spoke getting treatment for shingles... "I've actually had it for a few weeks now, and to be honest, I didn't know whether I was going to be able to start. Thankfully it eased up towards the end of last week, and I was able to race. Perhaps that's why I had a slightly sub-par run?." I pointed out that her run (2:57:32) wasn't too shabby! "I guess so! While it was slower than I wanted, you have to take the whole race into account and on that basis I really can't complain at all, I'm very happy with my race". Before talking about the race, we chatted about her 'event' experiences at Roth and with the Challenge Team, since as someone who has travelled widely - with work and through triathlon - new events, experiences and people are an important part of the whole experience for Chrissie. "Roth was actually one of the first races I'd heard about when I started doing triathlon. Belinda Granger was always talking to me about it - I think she's done it about six times now - and said "Chrissie, you just have to do this race", so I had some expectation." "However... my expectations were surpassed! The whole understanding of the sport and the distance, the history and the passion that the people there have is amazing. Felix (race organiser) and his team have an incredible attention to detail, and go out of their way to ensure the best experience and preparation for everyone - the pro's and the age groupers. The town of Roth is also incredible. Everyone gets behind the race, it's mentioned everywhere, almost every shop has some sort of memorabilia or reference about the race in it's windows - it's a town that really wants the event, and that makes it very special." So you'll be back then?! "Definitely. I think it's important not to get too caught up in the politics, and try and support different races, and different organisers in different countries, and the Challenge Team do an amazing job." All the pre-event talk was about times and records, so we discussed whether this added any extra pressure? "No, it didn't really. Of course, I wanted to beat the record - it's a great honour to have of course - but that wasn't really the aim. I wanted to race well, as well as I could, and win the race, so I just focus on that and my own race, and not add extra worries about the record." On the Friday before I'd said that it would probably take a world record time just to win anyway - which it did - the field was really strong wasn't it? "It was, it was amazing, there were some fantastic girls racing, and really I think it was probably second only to Kona." The swim seemed about on expectation, would you agree? "The swim was solid. I was pretty happy with it, though not ecstatic. I exited with Bek (Keat), which is a pretty good swim for me. I think I could possibly have hung with the front pack and maybe done a '48' (Chrissie swam 50:28), but with all the thrashing about at the start, that didn't happen, but overall, it was pretty solid." The bike seemed particularly fast I thought (4:40:28)? "I was incredibly happy with my bike. I felt comfortable, that I wasn't over-exerting... but also because I can see a lot of room for improvement and opportunity to go faster. Not necessarily through additional power or fitness, but technically - descending, cornering - I'm improving, but I've got plenty of room to get better, and that's quite exciting. It was also a very fair race - the fast guys were really fast anyway, so I couldn't stay with them, and on the second lap the age groupers I was around were slower, so I really was on my own for most of the day, and I think that was the case for most of the girls behind too." On the run, for perhaps the first time, we saw two girls (Cat Morrison and Rebekah Keat) make up some time on you in the early stages, were you concerned? "I felt pretty good on the first part of the run. I ran the first 10km in about 40:30 I think, so on target. I was surprised when I heard the gap had closed, and tried to do the maths - not my best subject, and I think it took me the next 10km (!) - but just did my own run. I had a patch between 15-25km where I felt pretty shabby, but after that I felt pretty strong for the rest of the run. The course wasn't as easy as I'd been told, and there were a few climbs which were perhaps taking more out of me than they should. I was hoping for about a 2:53, but in the context of the overall race, 2:57 was ok! I spent a lot of the last 3km waving to the crowds and cheering - if you can't take it all in and give something back to the crowds, you shouldn't be there!" "Rebekah had a great race, she's really improved under Brett Sutton and that's great to see. And Cat - she is such a nice girl, I couldn't think of anyone I'd be more honoured to share the podium with. She's a great athlete, tough, determined... and a whole lot of fun! She had her problems but she came through, and showed it's as much a mental thing as physical. She has a great future in Ironman." Can you compare your performance from Frankfurt last year to Roth - time aside, was it an improvement? "The bike was definitely an improvement as I mentioned. The run too - while I may not have been able to show it in Roth, that's better this year. I was very pleased with my run at Kansas 70.3, and my training times show improvement too - so, more to come I believe." There seems to be a real strength in depth in ladies iron-distance, with Cat and Bek in Roth, add in Bella, Yvonne (van Vlerken), Sandra (Wallenhorst) and plenty of others - is that how you see it? "Absolutely, it's fantastic. It's a bit like this record. The time has been set, and now it's there for everyone else to shoot at. It's those targets and the competition that pushes us all on - and I think we're scaring a few of the guys too!" You've made lots of changes this year - bike, coach, training groups and where you live; has it been difficult to manage all that, and still come out, do the training you need and still perform? "Yes, there have been lots of changes and adaptations to make, and sure, it's not been easy all of the time - I'd be lying if I said it was - but it's still the same racing head, the same heart and and the same effort, and so it's worked ok."
How do you recover after an Ironman? I usually do about two hours of "something" each day for the week afterwards - spin on the bike, or a swim - nothing structured. I think doing something, for me anyway, works best and helps flush out all the lactic acid and toxins from the race." Even the day after the race? "I didn't after Roth, simply because we were so busy, but after Australia for example we were at the beach and went body surfing! Just something to be active really." Next races? "Next I'll be doing the Timberman 70.3. It's a fun race, has a great spirit - a real festival feel. I might be racing Cat again there - though I told her I'd give her £100 if she doesn't! I may possibly do one other race after that, maybe a local half or another 70.3, and then it's Kona." Do you think the ITU has gained the upper hand in terms of profile recently, and perhaps left the long course athletes in the shade? "That might be true in the UK - probably a reflection of the focus on that discipline by the Federation - but I think overseas, certainly in the US, Germany and Australia for example, the long distance has much more profile. I think the ITU have done a lot of good - got a lot more professional perhaps - but even relatively recently, you could argue that their series had got stale, the 'wet runners' etc. I love watching Al Brownlee race now, he's a real 'balls to the wall' athlete, and that's great to watch. I think those countries mentioned are used to having Ironman champions; Scott, Allen, Stadler, Hellriegel, Michellie Jones, Macca etc -which has given the long distance racing the profile in those areas. I hope I can do the same for the UK." "I won't really think about 2010 until after Kona, but like last year and this, it will be three ironman-distance races, plus a few others to mix it up a bit. I take a month off after Kona, and therefore it takes until about March to get fit, race fit, so that reduces the options a little, but I suspect it will be an April and July Ironman plus Kona. 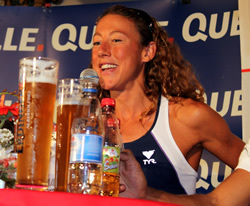 "Oh, and no, despite what anyone says I won't be going for London 2012! Not in triathlon anyway. Gymnastics maybe, or perhaps crown green bowls..."
As we reported last week, Chrissie has just re-launched her website: www.chrissiewellington.org. 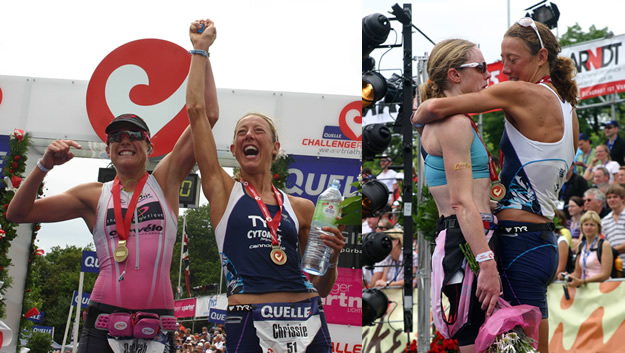 Check it out, as we're sure Chrissie will shortly be posting her always highly amusing and passionate, race report from her record breaking Roth experience.